On Sunday 10th April the Oxford Saints opened the 2016 season in front of a decent crowd with a 36-12 home win over the visiting Cornish Sharks. 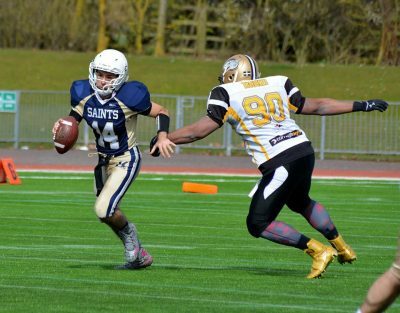 Following a successful 2015 season in Division II Southern Football Conference West, the Saints made the playoff stage but fell in the quarter finals to the Sussex Thunder, who have since been promoted to Division I. 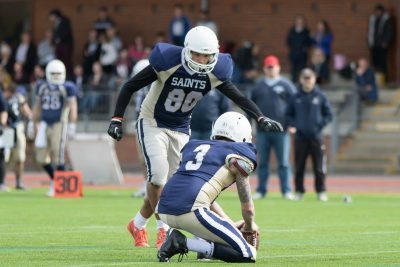 Competing in the same conference, the Saints will be looking for a deep playoff run and have made many improvements on and off the field in preparation. 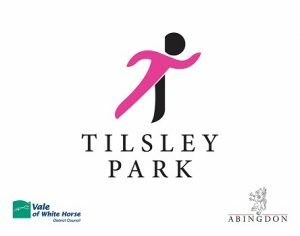 Moving to Tilsley Park in Abingdon, the Saints have agreed terms to play all home games at this new venue which has been recently renovated and a 3G field added. 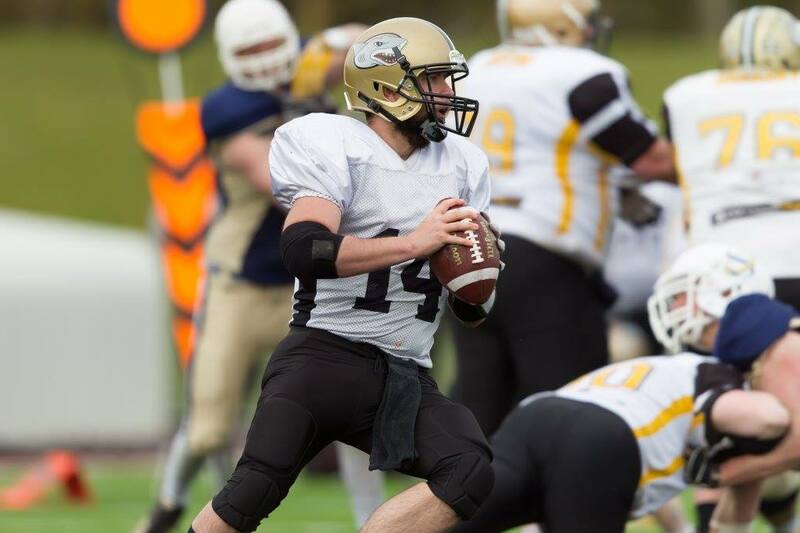 An addition to the squad is American Destin Maulding as quarterback, bringing experience from playing high school football in the USA. Matt Walsh, site manager for Tilsley Park was named the special guest and selected to perform the pre-game coin toss with the team captains. 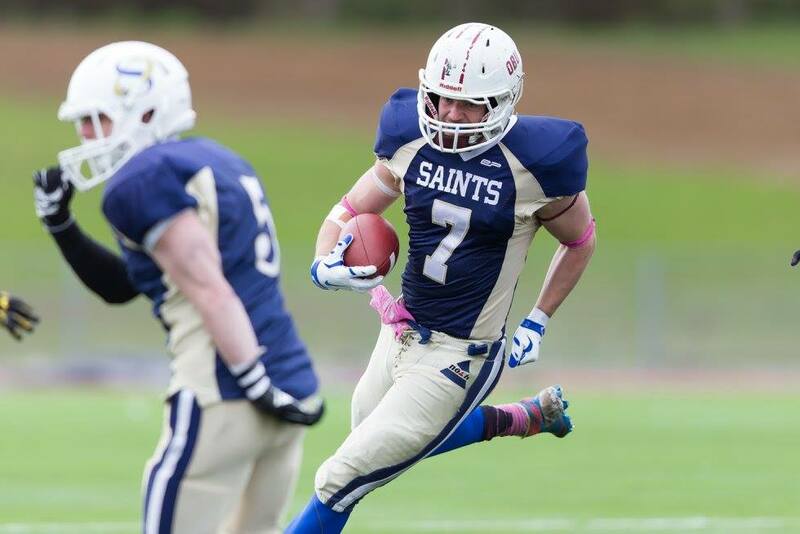 The Saints began with possession of the ball and made good progress with a strong performance from running back #24 Rob Johnson, picking up 25 yards on 3 carries. On the 6th play of the drive, Oxford quarterback #14 Destin Maulding found the towering tight end #83 Richard Bloomer uncovered in the endzone and completed the pass for the score. 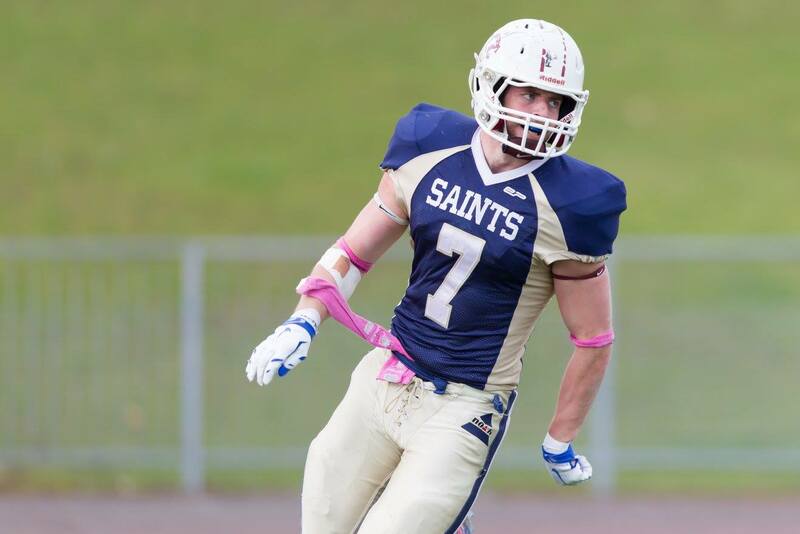 This marked the opening touchdown of the season and Bloomer claimed the first score at the Saints new home. 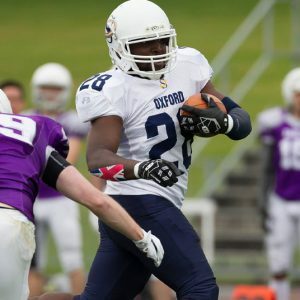 Oxford’s rookie kicker #80 Sam Fielden lined up for the extra point kick but the ball was not set in place in time and instead holder Ian Hiscock made the call to scramble with the ball and pitched it to Richard Bloomer who attempted to run it in to the left for a 2 point score. 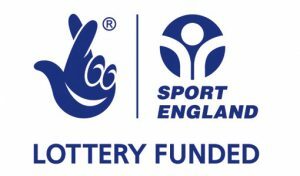 Just as he was being tackled, Bloomer successfully pitched the ball again to Sam Fielden on the outside, who ran it in for the 2 point score. 8-0 Oxford. The Sharks hit back quickly with a deep pass from quarterback #14 Peter Carlin which was hauled in by his receiver, costing the Saints heavily and brought the Sharks within a few yards of the endzone. The play was reminiscent of when the two teams last met in 2015 and the Sharks went for the deep ball on the first play of the game, catching the Saints defenders off guard. 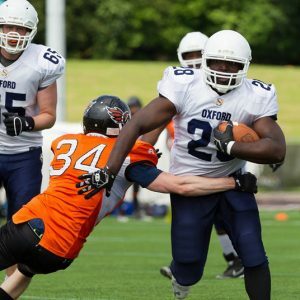 With Oxford’s defense attempting to rally and stop the quick Shark attack, Peter Carlin sneaked the ball across the line on only the 3rd play of the drive to score the touchdown. Looking to even the score with a 2 point attempt, Carlin’s pass was incomplete. 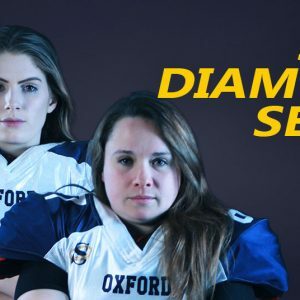 8-6 Oxford. 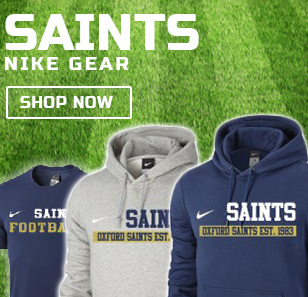 The Saints continued to look on good form with Destin Maulding showing his talent and speed as he led Oxford’s offense towards the endzone again. Maulding took off on one play and ran the ball up the sideline for a 9 yard gain and then capped the drive off by running the ball into the endzone himself for a 13 yard touchdown. 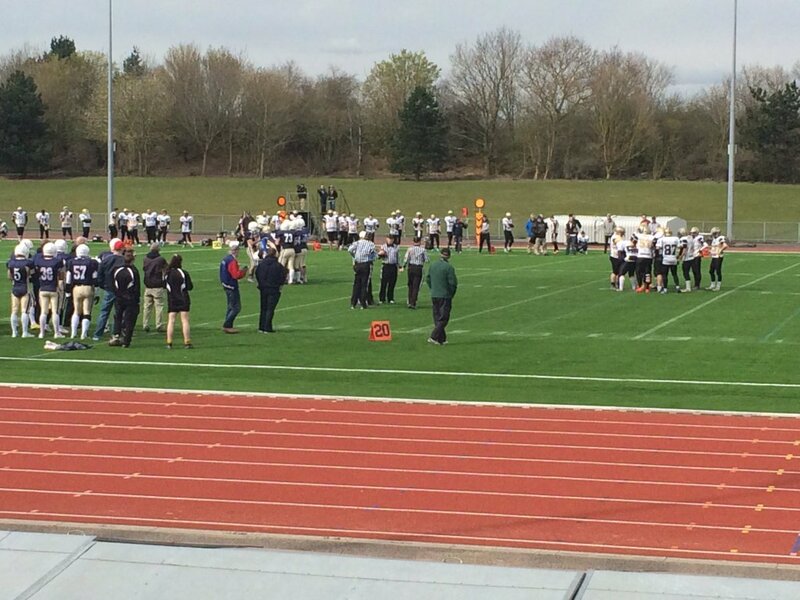 Sam Fielden lined up for the extra point kick which was good, extending the lead to 15-6 for Oxford. 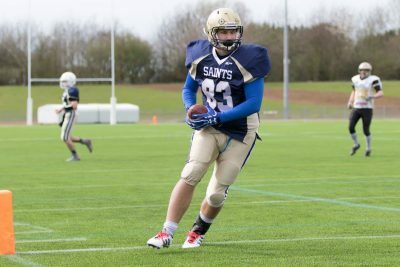 The Saints defense held strong on Cornwall’s next drive with tackles from #99 George Wright and #51 Sam Stancombe, bringing the ball carriers to the ground on back to back plays, forcing the visitors to punt the ball. Maulding went to work on the next drive and completed a deep pass to tight end #6 Grant Tebb for a 21 yard gain, followed by a 19 yard pass to #83 Richard Bloomer who charged into the endzone for his second touchdown of the afternoon. 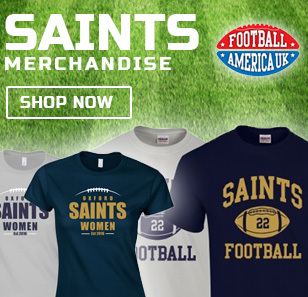 Fielden kicked the extra point and the Saints went up 22-6. 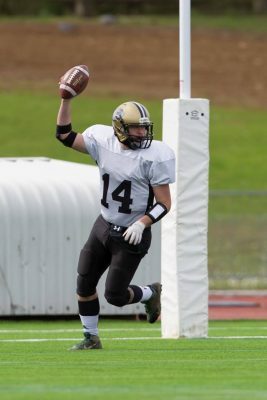 Cornwall’s Peter Carlin and his offense were beginning to move the ball on the ground with short but consistent gains. 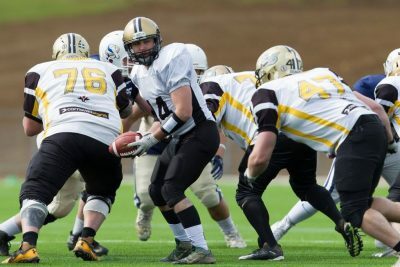 After picking up a first down, Oxford defender #52 Conor Whitehouse (later awarded Defense MVP) made an outstanding play and charged through Cornwall’s offensive line to deliver a big hit to the ground on the ball carrier, setting them back -5 yards. 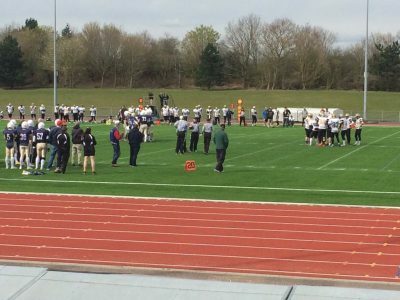 The Sharks attempted to recover the lost ground with another run attempt but were stopped by #48 Graeme Taylor, forcing another punt. 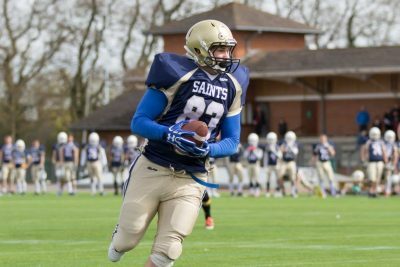 Oxford’s next drive saw this biggest pass play of the day with quarterback Destin Maulding throwing a perfect ball 42 yards downfield into the talented hands of Grant Tebb, hauling in the reception for a huge gain and to applause of the Saints sideline and spectators. Running back #7 James Walter, selected for the GB National Team in the offseason, attempted to move the ball on the ground but the Sharks had already identified him as the key threat in the game and worked hard to minimise his impact. A deep pass intended for Walter was contested in the air but fell incomplete, forcing the offense to punt the ball away for the first time. Closing out the 2nd quarter, Whitehouse delivered another solid tackle for a loss of yards on the Sharks ball carrier, with teammate Sam Stancombe claiming three tackles on the same drive, allowing the Sharks offense minimal or no gains. With the Sharks beginning the 2nd half with the ball, the Saints defense began to increase the pressure with #54 Dean Bryan and Stancombe stopping the ball carrier on the first play for no gain. On the next play, linebacker #68 Calvin Holmes read the quarterback’s movements and intercepted the pass from Carlin, racing it 35 yards into the endzone for a touchdown with thunderous cheers and applause from the fans. Fielden remained on perfect form in his first regular season game and kicked the extra point. 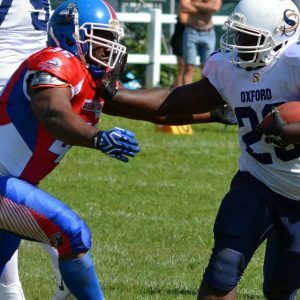 The remainder of the 3rd quarter saw both teams unable to find the endzone but an improving Sharks defense, which managed to sack the nimble Maulding for an 8 yard loss and successfully kept the Oxford offense out of the endzone. The Saints defense continued to be formidable with tackles from Graeme Taylor, George Wright and tackles for loss of yards by Calvin Holmes and rookie #55, Eric Mendoza. In the air, defender #3 Ian Hiscock broke up two pass attempts and prevented Carlin from connecting with his targeted receivers. George Wright delivered a punch with a sack on Carlin to end the drive, delivering the Sharks a -6 yards loss. Later in the 4th quarter, the Sharks were in scoring distance after a stalled Saints drive turned over possession of the ball deep in their own territory. 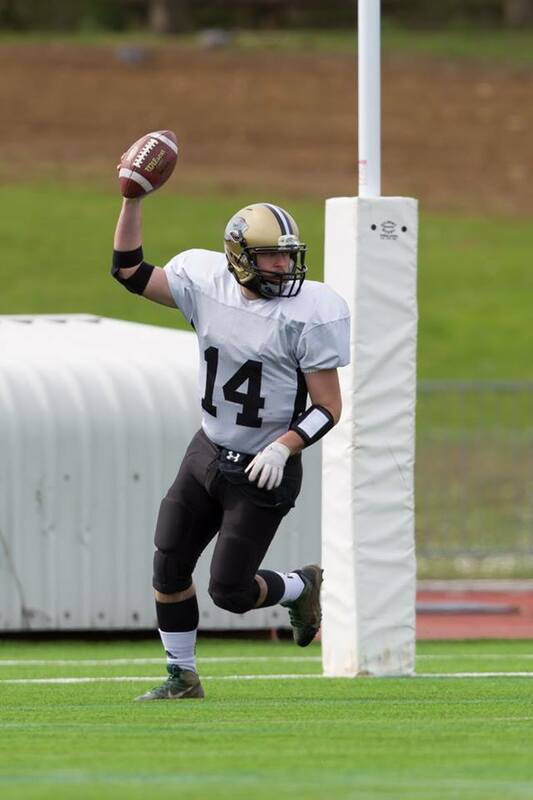 The ball was handed off to #21 Mark Womble who ran into the endzone from 15 yards out for a touchdown. 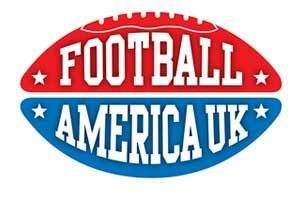 Womble attempted to run the ball in again for the 2 point conversion but was unsuccessful. 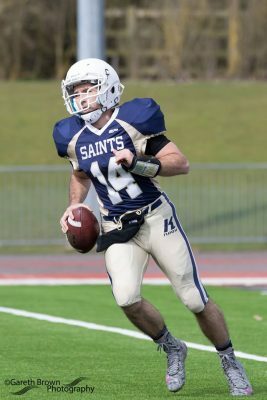 The final drive for the Saints offense saw Walter and Tebb bearing the load with both players moving the ball well up the field. From 20 yards out, the ball was put in the capable hands of Walter who charged towards the endzone and easily out ran the the Cornish defenders in pursuit, claiming his first touchdown at Tilsley Park. 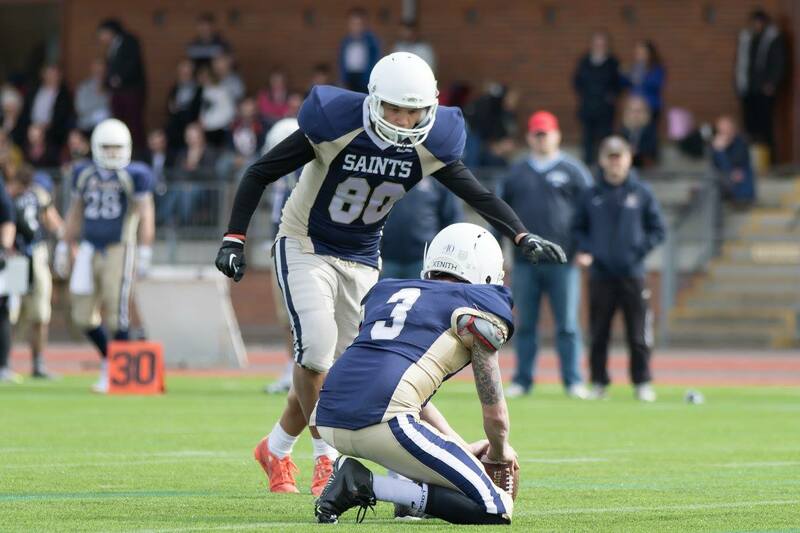 Fielden kicked another successful extra point and the hosts ended the game with a 36-12 victory. 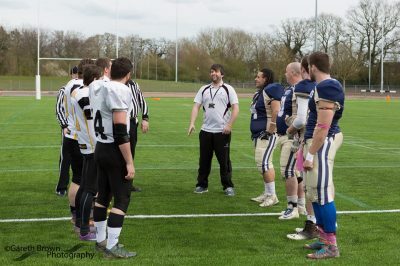 Also in action this weekend in our conference was the Swindon Storm who defeated the Jurassic Coast Raptors. Meanwhile, the Bristol Apache took down the Torbay Trojans. 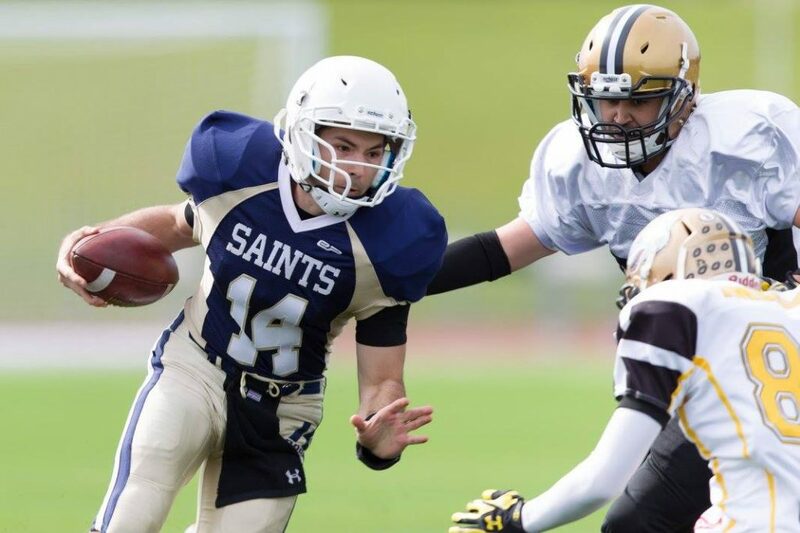 With lots of rookies and 2nd year players in action, the 2016 Saints performed well in the season opener against their old rivals. Following another very productive offseason, the team has recruited well with approximately 90 registered players. 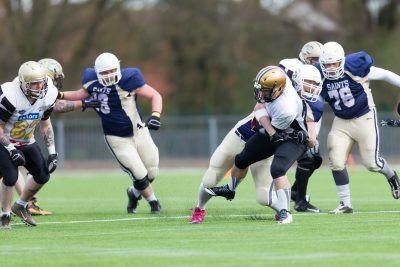 Before each game, the coaching staff select the 60 players they want for the game squad so competition in training remains intense as veterans are challenged by newer players. Off the field, negotiations to move home games to Tilsley Park has seen the Saints sign a great deal so that we can deliver a greater gameday experience for our fans, players and our opponents. The feedback on our first game at the new venue was very positive and we now have a solid base to build upon. 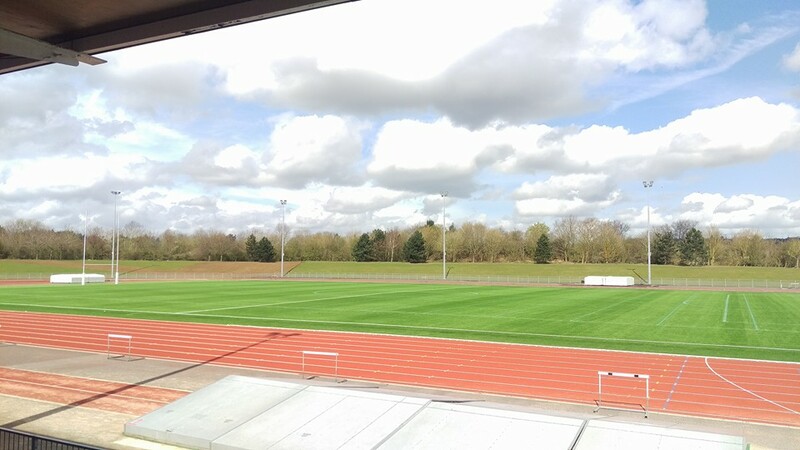 The freshly laid 3G field gives our players an excellent playing surface and the stands give visitors a much improved view of the action. The addition of a PA box and sound system means we can create a fun atmosphere with music before, during and after the game, along with commentary and sound effects (any Patriots fans notice the touchdown horn when Calvin Holmes returned the interception?). The Oxford Saints now have back to back road games as they travel to Bristol, Torbay, Dorset and Swindon. The next game for Oxford is 24th April against conference favourites, the Bristol Apache. 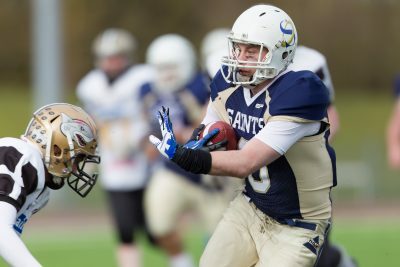 Full schedule available here http://www.oxfordsaints.com/schedule/. Photos courtesy of Gareth Brown Photography have been uploaded. Check out their excellent work below.